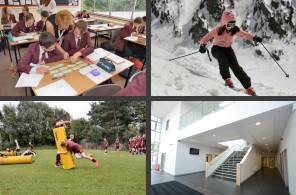 The process of education at Tytherington is seen as a continuous development from Year Seven to Year Thirteen. Teaching groups are arranged in a variety of ways to cater for the different abilities of students. Information on students’ ability at the start of Year 7 is gathered from the following sources: primary schools (SATS results, Teacher Assessment and information from the class teacher) and CATs (Cognitive Ability Tests) undertaken by students at the start of Year 7 at Tytherington. Students in Year 7 are mostly placed in mixed-ability groups, except for English, Maths, Science and Languages, where they are set according to ability after Christmas. Additionally there are 2 groups which have been set for all subjects apart from PE and Science, according to ability, one on each side of the year, for whom a more tailored pathway is deemed to be most suitable. All students follow the Key Stage 3 curriculum for two or three years. The grouping of pupils at the end of Year 7 is determined by their performance in the range of subjects studied. These are outlined below. In Year 8 and 9 students are taught in ability groups for all subjects. Mathematics, English, French, German or Spanish, Geography, History, Science, Religious Education, Music, Art, Drama, Technology, Physical Education and Computing. Students who have weak literacy skills are offered additional English / Literacy lessons as an alternative to a second language. Mathematics, English, French, German or Spanish, Geography, History, Science, Religious Education, Music, Art, Drama, Technology, Physical Education and Computing. Students with weak literacy / numeracy skills receive two hours additional literacy and two hours additional numeracy support per fortnight as an alternative to a second language. Mathematics, English, French, German or Spanish, Geography, History, Science, Religious Education, Music, Art, Drama, Technology, Physical Education, German and Computing. Students with weak literacy / numeracy skills receive two hours additional literacy and two hours additional numeracy support per fortnight as an alternative to a second language. Students start GCSE Science in Year 9. The spread of subjects in Years Seven, Eight and Nine includes all those required by the National Curriculum to Key Stage 3. Each student also follows a course in PSHCE including Citizenship, Careers and Work Related Learning during tutor time and ROSE Days. (R.O.S.E stands for Respect for Others, Self and the Environment’ and ROSE days take place 4 times per year, involving a collapse of the normal timetable and a programme of sessions for students. More information can be found on the ROSE / PSHCE section of the Curriculum information on the website. Pupils in Years 10 and 11 follow GCSE, BTEC and Vocational courses either on site or at College. Compulsory: PSHCE, Careers, Work- Related Learning and Physical Education. GCSE Options: Art, Business Studies, Child Development, Computer Science, Drama, Design Technology, Food Preparation & Nutrition, French, German, Spanish, Geography, History, ICT, Computer Science, Music, PE Exam, Sociology, Psychology, RE (full GCSE). Full course Level 1: Courses are offered in Catering, Construction and Hairdressing and Motor Vehicle Maintenance. Short course Level 1: courses are offered in Vocational Studies, Money and Finance Skills, Home cooking skills and Workskills. Different pathways are offered in order to personalise the courses studied by each student in Years 10 and 11. Details of courses are published each year, and parents are involved closely in the choice of subjects. Students negotiate their subject choices with the guidance of their form tutor and Head of Year, the careers staff and members of the leadership team to enable them to fulfil their academic potential and work towards the career of their choice. All pupils in Year 10 are given work-related learning opportunities (which may include work experience). Students preparing for Years Twelve and Thirteen attend an Induction Day in June / July which offer opportunities to examine a wide variety of skills required for study in the sixth form. The Induction programme continues through ROSE Days. Preparation for higher education, apprenticeships or employment is developed through structured ROSE Days, assemblies and tutor time. Careers Advisers attached to the school are also available to offer guidance to individual students. The curriculum for Years 12 and 13 provides courses for students of all abilities. ‘AS’ and ‘A’ Level courses are offered in: Art, Art Textiles, Biology, Chemistry, Computer Science, Drama, English Language, English Literature, French, Geography, German, Government & Politics, History, ICT, Mathematics, Further Mathematics, Music, Music Technology, Physical Education, Physics, Product Design, Psychology, Sociology and Spanish. Applied ‘A’ level courses are offered in: Business, Health & Social Care and Science. Sixth Form Tutors work closely with the local Careers Service and give all possible assistance with applications to universities, colleges of higher education and other career avenues. The school has an outstanding record of success in advanced level examinations and of entry to higher education.